REMOVAL AND INSTALLATION. By appointment only 9am-5pm Tuesday through Thursday, (407)830-0777. DROP OFF of removed stereo equipment is accepted 9am-5pm Monday through Friday. Sanford area, take 17-92 south to Ronald Reagan Blvd. (old CR 427) and turn right. Approximately 1.5 miles turn right onto Big Tree Dr. You have entered Big Tree Crossing Industrial Park. Turn right onto the second Corporate Sq, second entrance on left, near end of strip center on right. Lake Mary, or see I-4. From Lake Mary Blvd and Country Club Rd. south to Ronald Reagan Blvd. (old CR 427), turn right, .2 miles to Big Tree Dr. turn right. You have entered Big Tree Crossing Industrial Park. Turn right onto the second Corporate Sq, second entrance on left, near end of strip center on right..
UCF, Central Florida Greenway North, 7.1 miles to CR 427 exit. Ronald Reagan Blvd. (old CR 427) south 5.3 miles to Big Tree Dr. turn right. You have entered Big Tree Crossing Industrial Park. Turn right onto the second Corporate Sq, second entrance on left, near end of strip center on right. 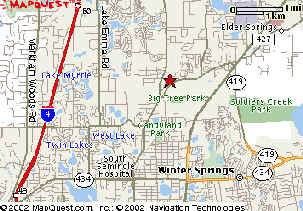 I-4, to exit 94 (old exit 49) - 434/ Longwood/Winter Springs, turn east on 434. 2.7 miles to Ronald Reagan Blvd. (old CR 427), turn left (north). 2.2 miles to Big Tree Dr. turn left. You have entered Big Tree Crossing Industrial Park. Turn right onto the second Corporate Sq, second entrance on left, near end of strip center on right..
17-92/436 intersection. North on 17/92 for 4.6 miles. Turn left onto General Hutchinson Pkwy, 1.1 miles to Ronald Reagan Blvd. (old CR 427) turn right. To Big Tree Dr., (second left turn). You have entered Big Tree Crossing Industrial Park. Turn right onto the second Corporate Sq, second entrance on left, near end of strip center on right.